Next steps on the SEBI story: An interview with U. K. Sinha, by Puja Mehra and Rajiv Bhuva, in Business Today. Mobis Philipose in the Mint. Uproar over I-T raids on SEBI members, in Business Today. In probing SEBI board members, go by CVC rule: Abraham, by Sunny Verma, in the Financial Express. Sebi may stick to its guns in MCX-SX case by N. Sundaresha Subramanian in the Business Standard. Sebi's Abraham emerges front-runner for FMC top job by Ashish Rukhaiyar & Sanjeeb Mukherjee in the Business Standard. An editorial in the Business Standard. Sunil Jain on the problem of recruiting a UTI Chairman, in the Financial Express. SEBI looks to amend law to protect officials from investigative agencies by Reena Zachariah, in the Economic Times. SEBI seems to have not backed away in the high court on MCX-SX. Static on the FM channel by Puja Mehra, in Business Today. That seventies feeling by Pratap Bhanu Mehta, in the Indian Express. Shubhashis Gangopadhyay in the Business Standard on land acquisition. We should be learning from these Afghans! A difficult patch in the Indian IPO market. Saurabh Kumar in the Mint on the extent to which IPOs from certain investment bankers are more exciting for investors than others. Demystifying Swiss banking by Priti Patnaik, in the Financial Express. Imagine there's no central bank. Steven Levy has a great story of how Google built Plus, in Wired magazine. And, PC World magazine on where and why Google Plus is better. Sebastian Mallaby in Foreign Affairs on how emerging markets should play the appointment problem of the IMF MD. The recent order by the Competition Commission of India on NSE and MCX-SX has a bunch of difficulties based on a lack of understanding of new age industries where a pricing of zero is quite feasible and important, a focus on protecting a competitor instead of upholding competition, etc. I wrote about this in the previous blog post. The most important problem with this order is that it represents a diversion away from the real story. 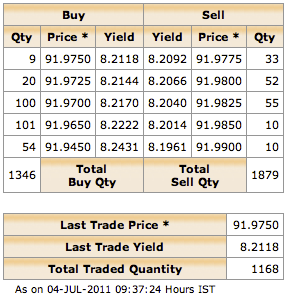 The real story is that trading in the Indian rupee is leaving India. The offshore OTC market (which is called the `non-deliverable forward' or NDF market). in April 2011, NDF volumes, at nearly $43 billion a day, were more than double those of the onshore OTC market (about $21 billion a day), and nearly 40 per cent higher than the combined OTC and futures onshore volume. Clearly, the bulk of price discovery for the Indian rupee has migrated offshore. While we are bickering about the valuation of one player in the onshore exchange-traded market, we are losing the plot. The real story is that India is losing the market where the rupee is traded. While we are fussing about NSE's charges on the currency futures market, the OTC market offshore charges zero and has steadily gained market share. Non-residents do not like to send orders to India given that India as yet lacks a residence-based taxation framework; they would rather send their orders to Singapore or Dubai or London which do. Indian capital controls hinder orders from non-residents: E.g. RBI prohibits FIIs from trading on the exchange-traded currency futures market (the only edge that India has in the trading of the rupee). Our mistakes in policy on these three fronts generate a genuine possibility of a hollowing out of the domestic financial system in coming years. The overseas market is the real source of competitive pressure. Unless overturned, the CCI order is working to reduce the market share of the onshore market. Financial policy has two goals in this field. First, we'd like for more business to be on the transparent exchanges instead of the OTC market. This goal is assisted by a price of zero at exchanges. Second, we'd like for more business to be in India rather than the overseas market. This goal is also assisted by a price of zero at exchanges.